For levels 56 through 60, click here. Level 71 / Door 71 Answer: Tilt your phone to the left (the chair should be rightside up) and drag the bar (the one on the bottom) from left to right. Tilt your phone to the right (the dresser should now be rightside up) and drag the bar from left to right. Level 72 / Door 72 Answer: Tap the saw blade at the bottom of the screen to add it to your inventory. Place it on cut mark on the lock. Begin dragging the saw left to right (you’ll hear a click with each successful swipe) to cut the lock. It takes 15-20, or so, cuts for the door to open. How we solved it: on each pipe there is a blue stone (1,2,3). The number below the pipe represents the total number of times you press the arrow, with the blue stone representing how many times you should press it. The first blue stone is at the very end, meaning you press the right arrow the full 13 times. The second and third blue stones are directly in the middle of the pipes. Level 74 / Door 74 Answer: Tapping the different lines on the doors make them disappear. Using the sequence above the door, turn on and off the lines to match up with what it show. First figure out the value of each line. 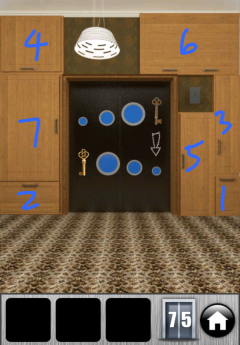 Level 75 / Door 75 Answer: Open the cabinets from smallest to largest to find the hidden key (image on door is the hint). In the following order press the cabinets: Bottom right corner, bottom left corner, cabinet above bottom right corner, top left corner, cabinet to left of bottom right corner, top right corner, last closed cabinet on left. Take the new key, open the bottom right corner cabinet, place the key inside, and close it. Open the cabinets again the same order, but skip the small bottom right cabinet (the one you just placed the key in). leave it closed. Press the cabinets again in this order: bottom left corner, cabinet above bottom right corner, top left corner, cabinet to left of bottom right corner, top right corner, last closed cabinet on left. Again take the new key. Use it to open the door. Congratulations! You have completed the levels 71 through 75 of 100 Doors of Revenge. Stay tuned for the next update! Uh hello… Level 73.. ?! Why don’t u learn how to solve these before frustrating other people by giving them half done answers and lies? But Ur doing a pretty good job with these cheats, aren’t u? I just retried the answer and it worked just fine. Maybe your game is bugged or maybe you didn’t press the arrows the correct number of times?